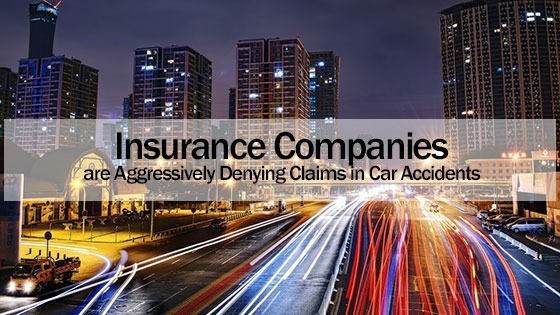 Home » Blog » Insurance Companies are Aggressively Denying Claims in Car Accidents. Find Out How a Car Accident Attorney Can Help. You have probably seen advertisements on television that show people how wonderful insurance companies are. The agents are friendly and talk about all of the ways that they can help you. However, the reality is that insurance companies will often try to deny claims. This is where an experienced car accident attorney can help you in dealing with a difficult insurance company that is trying to deny your claim. It is important to remember that insurance companies work for profit. Their goal is to make as much money as possible. If they can deny your claim or reduce the amount of money that they give you, then they will be able to make more money. Insurance companies have the right to review a claim to make sure that it is valid. The purpose of the careful review is to reduce insurance fraud. Insurance companies do have a right to deny a claim. However, there are certain criteria that have to be met in order to deny a claim. The car accident attorneys from the Law Offices of David Kohm have substantial experience dealing with all the tricks insurance companies use to try and deny or reduce claims, let us help you in recovering the most possible for your car accident. If an insurance company approves your claim, then they will likely want to give you as little money as possible. One of the ways that they do is this by minimizing your injury. They will try to say that your injuries were not severe. They may also try to say that the accident was not serious enough to cause your injuries. The insurance company may try to minimize your injuries by hiring their own independent medical examiner. The examiner will do everything that they can to say that the injuries are not as severe as the plaintiff claims. They may also try to claim that the person had the injuries prior to the accident. The insurance company may look through the person’s previous medical records. They will try to see if the person previously had the injury. They will also look at the type of treatments that a person had in the past. A car accident attorney can assist in dealing with the insurance company’s medical examiner and providing you the information that you need in order prove your injuries are what you say they are. Another way that insurance companies try to deny claims is by saying that there is not enough evidence to prove that a person was injured in an accident. The insurance company may claim that they will not compensate a person because they do not have any documentation from the physician. The insurance company may also deny a claim if the individual did not file a police report. The police report is used to determine who caused the accident. That is why gathering evidence is one of the most important things that you can do if you have been involved in an accident. You will need to keep a record of all of your treatments. You will also need to take photos at the accident scene and get statements from witnesses. By having this information you will be able to build a strong case. This is a common trick used by insurance companies to reduce your claim or even deny it. An experienced car accident attorney will know the tricks that difficult insurance companies use to deny and reduce claims. Let us help maximize the amount you recover. My Claim Was Denied. What Should I Do Next? It is an excellent idea to hire an attorney the moment you are involved in a car accident. Having an expert on your side that deals with car accidents and insurance companies on a daily basis is a smart thing to do. Attorneys are committed to helping their clients who have been hurt in a car accident. They can guide you through the difficult process of recovering money from car insurance companies. If you have been involved with an extremely difficult car insurance company you may even be able to sue them if they have violated your rights and broken laws. You should contact our law offices today for a free consultation if you need a car accident attorney. You can reach use at one of the following locations.